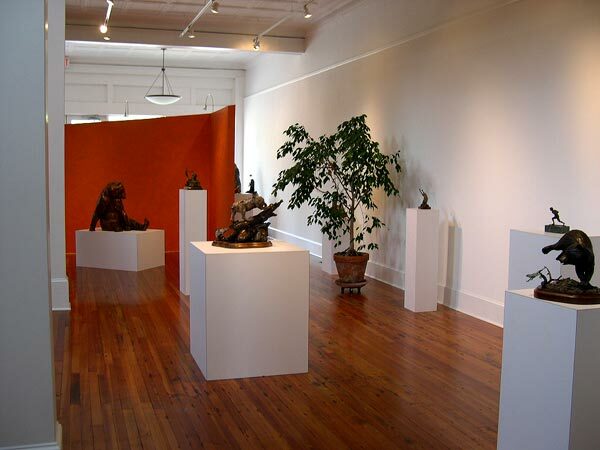 The Roger Martin Sculpture Gallery is located at 260 East Main Street in historic Downtown Albemarle, North Carolina. The Anderson family built the two-story brick building with graceful Neoclassical detailing at the southwest corner of East Main and South Fourth Streets in 1916. Mrs. Florence Anderson operated a grocery store in the Flemish bond brick building until 1938. The second floor was designed and utilized as "rooms for bachelors". In post World War II it was a Drug store and soda fountain. The drugstore was a popular hangout for the teenagers of Albemarle during this period. Through the years the building was used as warehouse space for various local businesses such as Swanson's, a cracker and cookie distributor and 5-Points Tire and Recapping. During the 1980's the building was the home of Martin Industries. In 2004 renovations were completed on the building for use as the Roger A. Martin Sculpture Gallery. Though totally renovated the new design includes the original heart pine floors, tin ceiling, interior doors and Frank Lloyd Wright glass prism tiles. On the second floor, yellow pine was used to repair the floors where the walls were removed, highlighting the location of the original walls. Many of the interior doors still retain their original finish as well as the brass number from the second story boarding house. The clawfoot bathtub in the gallery, now used as a planter, is the original tub from the boarding house. The architect on the renovation was Jim Asbel from Newport, Rhode Island. The contractor was Lee Morgan and Associates of Charlotte, North Carolina and the interior designer was Nancy Jo Fox, A.S.I.D., I.S.C.C., I.F.D.A. of Albemarle, North Carolina.